For some reason, my mother has made a pinterest page thingy full of Kids' Stuff. And on it there are various bath paint recipes. We don't actually have a bath at the new house, so bath crayons and paints tend to just run down the wall as they get splashed by the shower. Through trial and error we've concluded that the best recipe is shaving foam + food colouring. 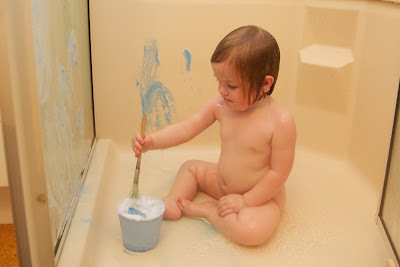 On the down side the bathroom stinks of shaving foam after Alex has had her shower, and she's now started painting with anything she can find. Last night she painted the dining table with her curry sauce.